Ayako Fuchigami, a retired dancer, said 'we just want to live a normal life’ after landmark win. Ayako Fuchigami won one of four prefectural assembly seats on the island of Hokkaido. ‘I am representing minority people who face many difficulties every day. I feel the weight of their burden on my shoulders’, the retired dancer told crowds said after winning the seat for Sapporo’s Higashi Ward district. 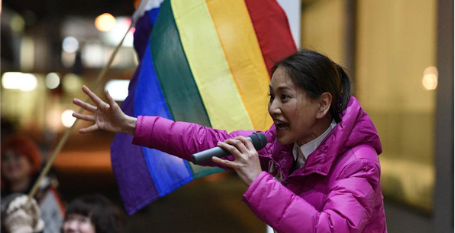 Fuchigami, endorsed by the Constitutional Democratic Party of Japan, spoke out for LGBT rights during her campaign.